Is there a better alternative to Winfo? Is Winfo really the best app in Desktop category? Will Winfo work good on macOS 10.13.4? Winfo shows info about the window under the cursor. Hold the Command (⌘) key to freeze the display, then click on a label to copy to the clipboard. 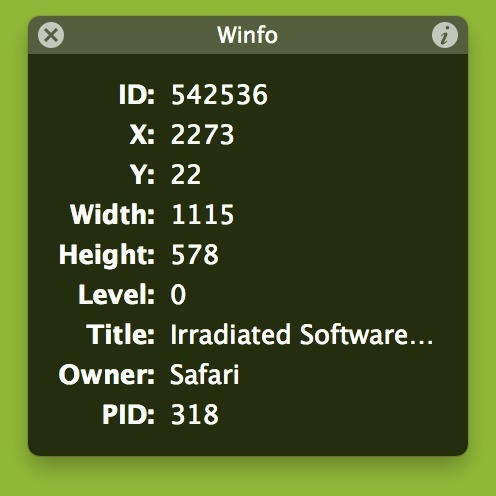 Winfo is useful for finding the app responsible for a window or menu bar icon. You can also use the window ID to take screenshots using screencapture via the command line. Winfo needs a review. Be the first to review this app and get the discussion started!